Interiew with director Varilabel Europe B.V. Borry Vrieling about our easy to use BagTag. 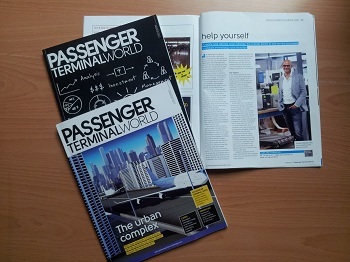 In the magazine Passenger Terminalworld June 2013. As passenger numbers all over the world continue to grow, many airports and airlines are asking how they can process these passengers efficiently, especially given the fact that existing terminals are difficult to expand and budgets are stretched, owing to high fuel prices and strong competition. The answer must be in adapting the information technology age we live in. As IATA says: “Simplify the business by just being smarter.” We all make use of modern communication technologies such as the internet, SMS, mobile phones, social networks and smartphone apps. This naturally paves the path for more and more self-service. As well as saving money, all initiatives aim to create a positive end-to-end passenger experience, while increasing capacity in the existing terminals and generating more revenue from passengers by giving them more time to shop and eat. This is a trend that won’t be stopped and there will be a complete self-service airport in the near future. The entire self-service, end-to-end process is driven by technology and the rea challenge is to make the technology easy for users to interact with. Let’s assume that an airport/airline invests in a high-end, onestep bag-drop unit that enables passengers to check in their bags themselves. It checks the weight and size of the luggage, facilitates payment for excess luggage and has all the security features required. A system like this is capable of cutting the bag-drop process down by minutes. But then there is the human factor. The whole process should be as intuitive as possible with no room for mistakes. Research has shown that the bag-drop process in general is the most emotional moment in the travel experience of a passenger. Hardware manufacturers are aware of this and design their products in a way that ensures there is no or very little room for mistakes. But the one thing that is not connected to the hardware design is the actions of a passenger. In the whole bag-drop process, a key component is applying the bag tag to the luggage. A lot of things can go wrong at this point: passengers may not understand what to do with the bag tag and have to look for assistance; passengers may think they know what to do but stick the bag tag the wrong way; or passengers do not know what to do but are too proud to admit this, so it takes them a lot more time than calculated in the business model. At this point in the process, an easy-to-use bag tag is essential to overcome all of the above and ensure confident and happy passengers. That is why Varilabel has introduced the future of selftagging – the high-quality BagTag with a magic adhesive that only sticks to itself, making it impossible to apply it incorrectly. The BagTag has no sticky parts that will stick to clothes, bags, floors, kids or machines, and it has no backing to pull away, and therefore creates no waste at the drop-off point. With more than five million passengers already using the BagTag, it has been proven that it satisfies passengers’ desire for an easy and comfortable travel experience, and airports and airlines will benefit from a selftagging bag-drop process that has high success rates. Varilabel is dedicated to this product and will work with customer in the future to customise it as and when required.